Men are reluctant to pass over from the notion of an abstract and negative deity to the living God. I do not wonder. Here lies the deepest tap-root of Pantheism and of the objection to traditional imagery. It was hated not, at bottom, because it pictured Him as a man but because it pictured Him as king, or even as warrior. The Pantheist’s God does nothing, demands nothing. He is there if you wish for Him, like a book on a shelf. He will not pursue you. There is no danger that at any time heaven and earth should flee away at His glance. If He were the truth, then we could really say that all the Christian images of kingship were a historical accident of which our religion ought to be cleansed. It is with a shock that we discover them to be indispensable. You have had a shock like that before, in connection with smaller matters – when the line pulls at your hand, when something breathes beside you in the darkness. So here; the shock comes at the precise moment when the thrill of life is communicated to us along the clue we have been following. It is always shocking to meet life where we thought we were alone. “Look out!” we cry, “it’s alive.” And therefore this is the very point at which so many draw back – I would have done so myself if I could – and proceed no further with Christianity. An “impersonal God” – well and good. A subjective God of beauty, truth and goodness, inside our own heads – better still. A formless life-force surging through us, a vast power which we can tap – best of all. But God Himself, alive, pulling at the other end of the cord, perhaps approaching at an infinite speed, the hunter, king, husband – that is quite another matter. There comes a moment when the children who have been playing at burglars hush suddenly: was that a real footstep in the hall? There comes a moment when people who have been dabbling in religion (“Man’s search for God”!) suddenly draw back. Supposing we really found Him? We never meant it to come to that! Worse still, supposing He had found us? So it is a sort of Rubicon. One goes across; or not. 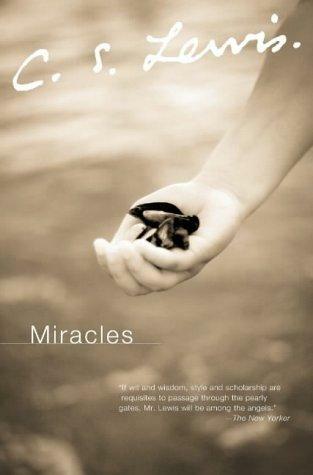 But if one does, there is no manner of security against miracles. One may be in for anything.